Your mac & cheese looks delicious! My husband has been bugging me to make some, so I think I will give your recipe a try! Great job; keep 'em coming! This sounds delicious! It also looks like the type of dish that would get rave reviews at a family pot luck. Looks good and awesome job with the nutrition facts and cost analysis! great article and super photo's! I have definately got to try this! Thanks for the recipie! This recipe sounds delicious. I can't wait to try it when my home grown tomatoes are ripe. Cant wait to try this with the first batch of garden tomatoes. 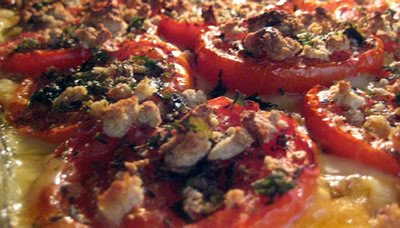 so funny.. just had this 2 nights ago.. my recipe was from Ina Garten (Barefoot Contessa) -- with tomatoes and breadcrumbs on top.. so yummy. She used cheddar and fontina cheese, but i used cheddar and swiss but it still came out good. Now my stomach is growling - so yummy! We also like to create a hidden layer in the middle of the mac and cheese - like sauted mushrooms and spinach or any leftover proteins. I love grilled cheese with tomatoes, so I'm bound to dig this, too! I really love that you include the nutrition stats. I notice this is really high in sodium. From the chicken stock, maybe? Back to basics and walla you got such a wonderful dish without the pomp but yet great in taste. Nice sharing. This recipe looks amazing and I have to tell you I LOVE your food blog! Having the prices is really helpful and I just love making something for a bargain! One of my favorite foods. Lovely recipe. So, I can show up on your doorstep, with my own plate, and fork? Seriously, though, that looks so fantastic. I've jazzed up mac & cheese with some crumbled bacon bits, but it never occurred to me to add tomatoes, which of course, go very well with both pasta and cheese. Aw man!!! It soooooooooooooooo rots being a Foodie on a low carb diet! I am on the high carb diet so this really works for me! Seriously, I cannot believe how good quality cheese has shot up in price with in the last year. Oooh! A baby blog! What a great idea for one too! Wow!!! 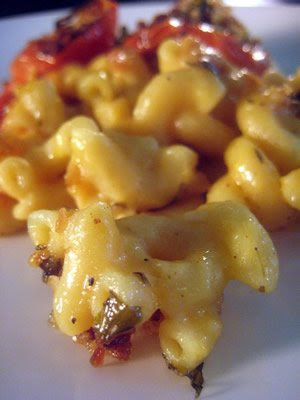 That is what a macaroni and cheese should look like. Mine looked nothing like yours. Mine was missing that kind of consistency and texture. So thankful you posted this! I looked at this in the am & made my mind up to have this for dinner this evening. A big hit here at our house. Thanks! Good job. Wowwwww....That is my kids favour!! they love to eat macaroni cheese. Thank you for sharing. Cheers ! Sunshine always. Thanks so much for all the lovely comments! We're giddy! 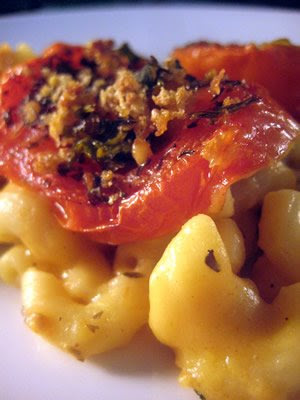 Gina: I've added many different things to mac n cheese, but never tried it as a "hidden layer": I might have to try that! Kelly: feel free to use low sodium broth and refrain from adding salt. Cheeses tend to have a high sodium content. Dee: so glad to hear your family liked it! Thanks for reporting back! Great job, made me hungry. Feed me more! ohhhh yum. that sounds delicious. i love homemade mac n cheese. and tomatoes are such a great addition! Oh yeah... I'd fight over that! Delicious delicious delicious ... in a way, isn't it a kind of lasagne? And wouldn't you enjoy a nice Chianti with that? mmmm. That looks really good ! I made this on Friday night - I added peas, and I used 2% milk and a little less butter - and it came out delicious! mac 'n' cheese. Comfort food at its best. With the added tomatoes...how much healthier can it get? Yum!! This is healthy, simple & yummy! What else can you ask for? Mmmm, never have I seen such a gorgeous looking mac n cheese! I love the idea of cutting down the fat a bit and adding vegetables. Looks amazingly tasty! & cheap is always a plus!! !